Guan Tianlang became the youngest winner at the Asia-Pacific Amateur Championship when he won the fourth edition of the event at Amata Spring Country Club. A final round of 1-under-par 71 gave the Chinese teenage sensation a 15-under total of 273 and a nail-biting one-stroke victory over Chinese Taipei’s Cheng-tsung Pan. After rounds of 66-64-72, Guan started the final day two shots ahead of his nearest challenger, Australian Oliver Goss, who eventually finished third. The 14-year-old began nervously and off-set his two birdies on holes 2 and 4 with two bogeys on the 7th and 9th. He picked up his game, however, on the back nine to fend off the challenge of Pan, who had a superb final-day 65 that included nine birdies. Weighing just 125lbs and averaging 250 yards per tee shot, he had found Amata Spring’s 18th hole, a par-4 of more than 470 yards a little tough going. Having bogeyed the hole twice in the first three rounds, Guan was under pressure to sink at least a par putt at the final hole to secure his win. He missed the green with his 3-wood second shot, then chipped to five feet with a 60-degree wedge. He used his belly putter, which he began using in June, to successfully sink the par putt, an effort that he admitted was a little nerve-racking. 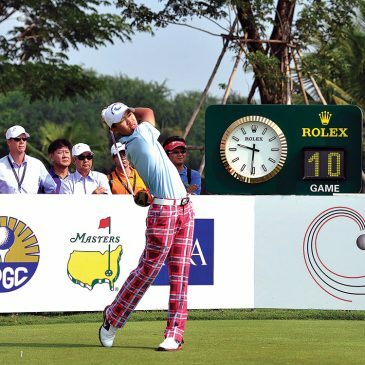 Guan became the first Asia-Pacific Amateur Chamiponship winner from China. Amata Spring Country Club has hosted numerous international events, including The Royal Trophy, the Asia-Pacific Amateur Championship and the Thailand Golf Championship in 2011 and 2012. These events have helped establish the notoriety and legacy of the course. In only a few short years, Amata Spring Country Club is now recognised as the preeminent facility in the country. No weather delays. Sunny, fine and clear with an average temperature of 28 degrees Celsius.